I live in walking distance from my office in Copenhagen, Denmark. One particular morning I decided to take photos of domain names I met on my way. How are domain names used by local businesses, and do they live up to their job as memorable digital road signs? My local real estate agent Estate is one of the local real estate agents down at Frederiksberg Allé, Copenhagen's "Champs-Elysées". The message below means: Sign up to our buyer's folder in the store and then a web address to know more at live-at-frederiksbergs-alle.dk. It's rare these days to meet a domain name with hyphens, let alone three of these. Hyphenated domain names are just so difficult to remember, and this one is no exception. I doubt that anyone will remember this web address, so 0 stars for this digital road sign. These guys don't know how lucky they are. A great domain name instead would be frederiksbergalle.estate. .Estate is a new generic top level domain, but they could just use it as a a dot brand for their own business. This one would be easy to remember. My local Chiropractor I actually took my kid to see this chiropractor some time ago. 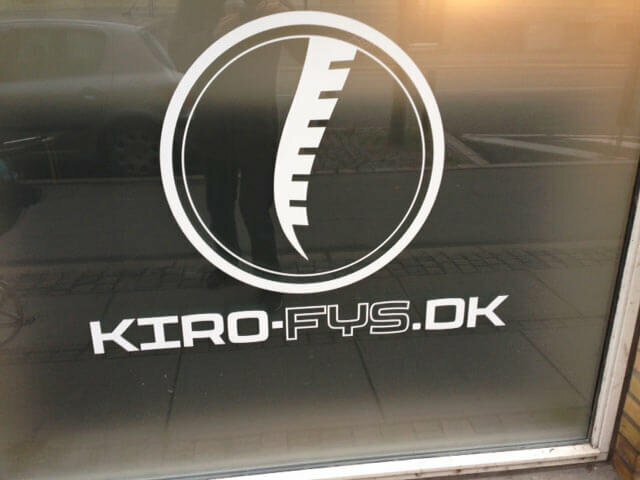 You would think that kiro-fys.dk is an abbreviation of their brand name, but this is the actual name. (kiro is abbreviation for chiropractor and fys for physical). Again, I'm not happy with hyphens in domain names, but ok, if it's their brand name, there really is no alternative domain name. Still difficult to remember though, if you one week later decide to do a booking with "that chiropractor in Frederiksberg". You will have to Google it, and their local competitors will also show up. My local sewing pusher I don't consider myself part of the customer segment for sewing, but this store had one great domain name. Sy means sewing in Danish. Short and sweet. Talk about a memorable domain name. I would remember this domain name, if I later planned to buy some sewing equipment online. It doesn't get any better. My local diving centre This local diving centre can be found on a side street to Frederiksberg Allé. 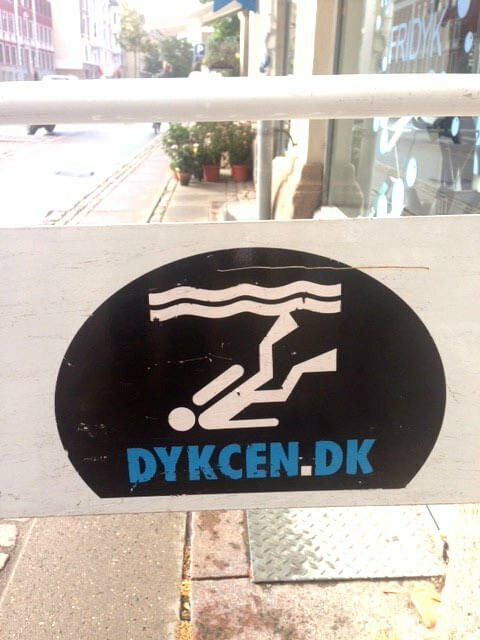 The real name of the place is Dykkercentret, however they use the abbreviation dykcen.dk as their web address. Abbreviated domain names only do their job, when they are memorable. This one doesn't. If you have a long brand name, and you want to shorten it, then the domain name really has to be very short; Two or three characters long. dc.dk would have been a good one. 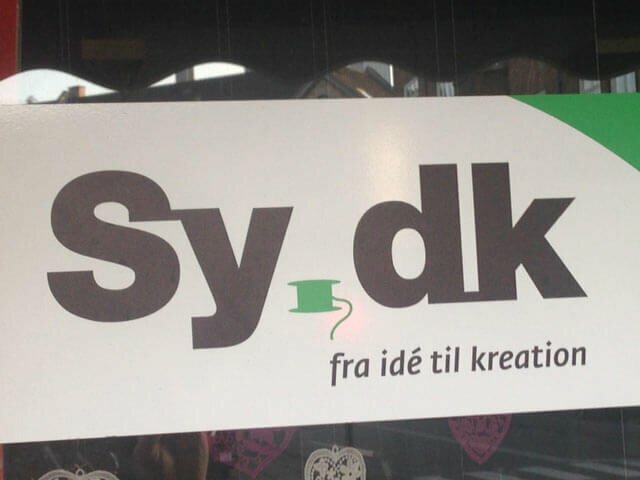 Their brand name dykkercentret.dk would have been good as well (they actually own the domain name!). The other alternative is dykker.center, which is available. Dykker means diver in Danish. Conclusions from my walk Local businesses are very prone to use their web address next to the company name on their physical premises (wall, window, poster). I assume logically that their objective is to have people access their website. 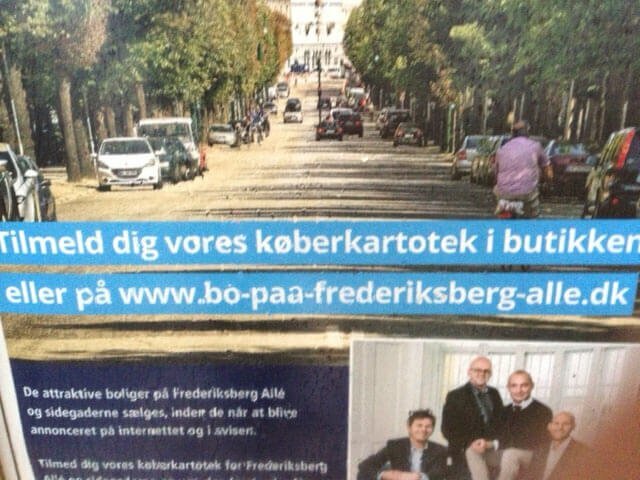 The domain names (apart from sy.dk) in these examples fail to do so in my opinion. A simple exercise for them would have been to stop some bypassers and ask if they can remember the web address, they have just seen. It's as simple as the radio test, and you get some valuable information. As you can see in my suggestions, the new top level domains can do the job of communicating effectively, where traditional domain names fail. There are 450 of these extensions out now, so if your domain name doesn't pass the test, you might want to have a look at them in the domain search box.